Here are some top tips for successful tomato growing. 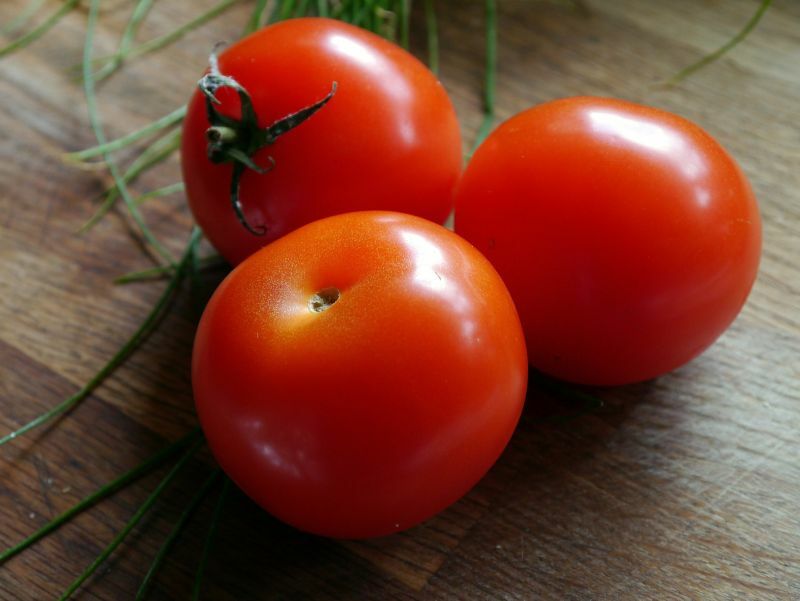 Tomatoes are a versatile food, rich in vitamins and nutrients. These properties are enhanced even further if you grow them yourself following organic methods. Tomatoes are fun to grow due to the many varieties. They are easy to grow and give a quick return. Tomato plants seem to be particularly fussy in this regard. They do not grow well if tomatoes were previously grown in the same soil. To prevent this being a factor for poor crop yield, don’t plant tomatoes in the same bed every year. Tomatoes grow well in almost any soil, but if you want high yields, you have to give them a good start by preparing the soil well when you plant them out. You can easily grow tomatoes from seed, and you will find that you get better yields if you start them is seed trays and then plant them out once they are strong enough. To prepare the bed, dig the top layer of soil loose to a depth of 150mm (6 inches). Mix a well decomposed compost into the loosened soil using about 1 spade full of compost per metre (3 ft)of the row. Start your tomato seeds in seed trays using normal potting soil in the seed trays. Once the seedlings are at a height of 100 – 125mm in height, transplant them out in the prepared row. The seedlings should be “hardened” about a week before planting out by exposing them to the sun and elements and withholding water a few days before transplanting. Make sure to keep a distance of 450 – 600mm between the plants. If you plant the seedlings too close together, the micro climate between the plants will be too moist and will promote the growth of fungi and other diseases and pests. Tomato plants need full sun, so after transplanting, it is not necessary to provide sun protection to the plants. Give the newly transplanted seedlings a good watering at ground level. This brings me to the next tip. Tomatoes do not like getting their leaves wet, particularly when they are about to fruit. The wetting of the leaves and fruit with a hose or sprinkler promotes growth of various fungi and related fungal diseases with affect the leaves (make the plant unhealthy) and cause the fruit not to develop correctly or to develop with diseased areas. 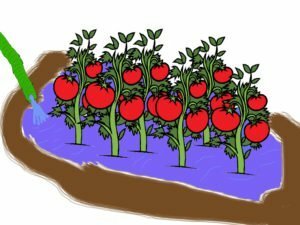 The best way to water your tomato plants is to use flood watering. You can achieve this by raising the soil on either side of the row to create a little dam, and then flood this area by letting the hose run with a moderate stream so as to not wash away your dam to fill the area. Tomatoes need a constant moisture level in the soil. One of the biggest factors that inhibit fruit production is an erratic water supply. In an area where restrictions apply, or drier locations, a drip irrigation system delivering a constant steady supply of water directly to the base of the plant will make sure the moisture levels are kept constant. Some tomato varieties are creeper or vines and need to be trellised anyway. Stake your free standing tomato plants to give them extra support when fruiting and to keep the fruit off the ground and away from pests. The extra support also helps the plants withstand windy conditions. You can alternate these plants between your tomato plants and get multiple crops form the same bed! Here is a summary of the top tips to getting a great tomato harvest. Hope you try out these tips and let us know if it improves your tomato yield.